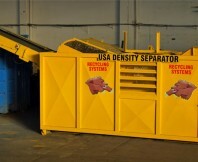 With landfill tax increasing Recycling systems launched the new RS USA Density separator for reducing material going to land fill. Ideal to process Trommel fines, the RS USA Density separates lights and heavy fractions and recovers a sellable product therefore reducing landfill tonnage and cost. Due to the modular design this unique machine can be part of an overall static recycling plant or configured into a site mobile machine.